Three people are dead after a Range Rover opened fire on a Maserati on the Las Vegas Strip, The Associated Press reports.Initially police said there was a gunfight between the two cars, but investigators now think that no one in the Maserati was shooting. Police Sgt. John Sheahan said that around 4:30 a.m. gunfire from a black Range Rover Sport caused the high-end sports car to hit a taxi, which burst into flames. The Maserati driver, the taxi driver, and a taxi passenger were killed. Four other people — including a passenger from the Maserati who was shot — were hospitalized, three of whom have since been released. 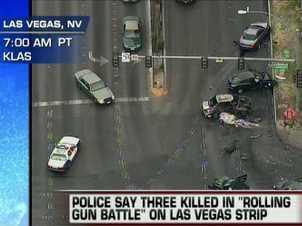 Three other vehicles were involved in the wreck, which occurred at the intersection of Flamingo and Las Vegas boulevards — a wide intersection surrounded by famous casinos including the Bellagio, Caesars Palace and the Paris. AP notes that it’s the third violent event in Vegas this month as two people were critically wounded in a shooting at a parking garage on Feb. 6, and a tourist was stabbed in an elevator at The Hotel at Mandalay Bay Feb. 16.